If you don’t have small kids, coloring books are one household item that probably aren’t in your inventory. But according to a Quartz article, that is changing for an increasing number of Americans, as purchases for adult coloring books have skyrocketed from 1 million to 12 million in the past year. Why are grown-ups coloring between the lines? The answer appears to be stress. Americans have good reason to be stressed out. Mass shootings, foreign policy standoffs, and contentious presidential election add to the perennial woes of income pressure. It also probably doesn’t help that we’ve been spending an increasing amount of time on social media and in front of screens. And it appears this mounting stress has created an opportunity for the benefits of coloring. This boom can be attributed in part to illustrator Johanna Basford, who could be described as the J.K. Rowling of adult coloring books. Her 2013 debut book, Secret Garden, is a bestseller on Amazon. 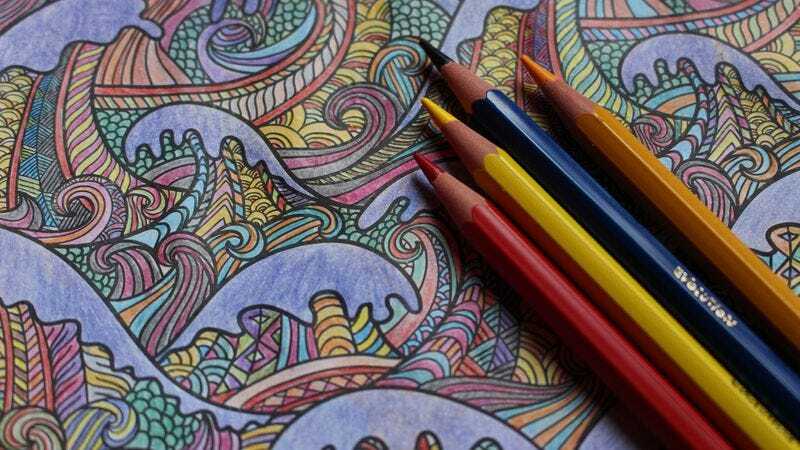 In fact, three of the 10 bestselling books on Amazon last year were adult coloring books. But what exactly is this activity offering that we can’t get from posting dog pictures on Instagram, or binge-watching an entire season of Better Call Saul? Of course, pop-culture obsessives might not be ready to ratchet back their Netflix queue and give up the remote for some fancy gel pens. For those folks hesitant to choose between their coloring books and their Cumberbatches, we’re happy to report that you don’t have to.